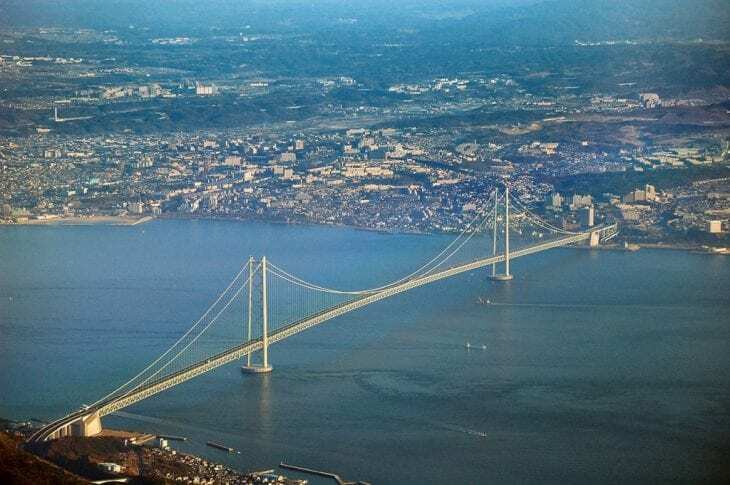 The world’s longest suspension bridges are listed according to the length of their main span which is the length of suspended roadway between the bridge’s towers. Main span of 1,991 meters (6,532 ft) – opened in 1998. Links the city of Kobe on the mainland of Honshu to Iwaya on Awaji Island. Its total length is 3,911 meters (12,831 ft). Main span of 1,650 meters (5,413 ft) and height of 211 meters (692 ft). Opened in 2009. Main span of 1,624 meters (5,328 ft). The bridge was opened in 1998 and runs between the Danish islands of Zealand and Funen. Its total length is 6,790 meters (22,277 ft) and max height of 254 meters (833 ft). Main span of 1,545 meters (5,069 ft) – opened in 2012. Main span of 1,490 meters (4,888 ft) – opened in 2005, the bridge crosses the Yangtze River in Jiangsu Province, China, downstream of Nanjing. Main span of 1,418 meters (4,652 ft) – opened in 2012. The bridge is built over the Yangtze River and is the third largest suspension bridge in China. Total length of 5,437 m (17,838 ft). Main span of 1,410 meters (4,626 ft). The bridge was opened in 1981. Total length of 2,220 m (7,280 ft). Main span of 1,385 meters (4,544 ft) and a total length of 3 km (2 ml), it was opened in 1999. It runs over the Yangtze River in Jiangsu, China, and is the second longest suspension bridge over that river. Main span of 1,377 meters (4,518 ft) was opened in 1997. It was the second longest suspension bridge at the time of completion. The bridge was named after two of the islands at its ends, namely Tsing Yi and Ma Wan. Main span of 1,298 meters (4,259 ft). This bridge is located in New York City and was opened in 1964 – making it the oldest bridge in the top 10. The bridge connects the boroughs of Staten Island and Brooklyn in New York City. Main span of 1,280 meters (4,199 ft), which puts it outside the top 10 list. The bridge opened in 1937 making it the oldest between all the bridges in the top 10. It is located in San Francisco. Total length of 2,737 meters (8,981 ft).